There are more cutthroats than I expected! Some are still in hiding and some are waiting for the right moment to delight and offend. Recently, the most fertile cutthroat fields have been surname dictionaries and board game names and cards (many suggested by @snapshot_reviews). If you see capital letters in this list – it’s either a surname or the name of a game. The attached PDF has 33 pages of cutthroats and their earliest year of attestation. Odd Salon is a beautiful collection of wolpertinger-loving historically minded nerds of drinking age who get together every two weeks and tell each other good stories about the amazing lives and creations of people in the past. I heard about Odd Salon recently, immediately signed up to talk about cutthroats, and gave my talk a week ago on August 23rd. The theme of the night was Mischief, and the other talks involved the Hellfire Club, cryptozoology, Satanism, and pirates. I’m very much looking forward to the Heist show next week. I have matched up the audio with my slides from the night and present to you here my latest rundown of what cutthroats are, where they came from, and what fun can be had with them. In this talk, I say and show vulgar words. Be warned and enjoy. What’s a cutthroat compound? I’m happy to explain. The chart above was created with the first usage dates from 1067 cutthroats. I currently have 1107 cutthroat candidates, but 40 of them are surnames or are otherwise dateless. Cutthroats are compounds that name people and things by describing what they do. Cutthroats are made from a transitive verb and a noun, where the noun is the direct object of the verb. For a brief academic summary of cutthroats, read my 2015 DSNA/SHEL abstract. For an overwhelming list of all cutthroat candidates catalogued thus far (there are more), check out these 1273 cutthroats. For more perspective on the topic, read the articles in the 2015 Cutthroat World Tour, or seek out the research of linguists like Volker Gast and Benedicte Nielsen Whitehead. These compounds have been called many names in the past, but it appears that I’m the first to call them cutthroats. You may be more familiar with tosspot, turncoat, scarecrow, wrap-rascal, Shakespeare, or terpsimbrotos. I use the term cutthroats to unify the bunch because cutthroat is the most representative example of the pattern. It is a calque from French coupe-gorge, and many early English cutthroat compounds were French loanwords, which were then translated and played with, creating variations and semantic clumps. Those loans influenced the topics covered by this pattern in the following centuries. I am aware that introducing a new term does not eliminate the problem of multiple terms. This is an update of the list of 892 Cutthroats posted a month ago. It seems the cutthroats multiplied while I was away in Vancouver. My deep appreciation to everyone who suggests potential resources and words to me. Each little compound ties into the larger web and illuminates a corner of this pattern. Thank you. I literally can’t do this without you. As before, there is much research to be done, and it is likely that a number of the attached cutthroats will not stand up to scrutiny. For now, I would rather include non-cutthroats than dismiss them during this wide sweep and regret it later. Once the pace of cutthroat collection slows, I will provide more details about the words−definitions, earliest dates, earliest sources, arguments for and against inclusion. If you know a cutthroat that does not appear on the list, please let me know in the comments, or contact me on Twitter. Some cutthroats use and describe vulgarity, so please consider your surroundings before taking a look at the list. Through the ripples of the article by Stan Carey about my research, I’ve been receiving many new cutthroats from the good people of the internet. Commenters fear that they are calling my attention to a cutthroat I already know about, so this is the temporary solution as I continue work on my SHEL/DSNA presentation. The attached PDF lists 892 words that I’ve been considering off and on as cutthroats. I question the membership of many of these words. Later, when there is time, I will provide a similar list with earliest dates of appearance, general categories (person, tool, game, animal, plant, adj, other), and specific definitions. Cutthroats are written variably with a space, no space, or hyphen, so check all listings for each verb if you’re looking for a certain entry. If you don’t see one on the list, please tell me about it here in the comments, or tweet @E_Briannica. NSFW: The list contains vulgar words not suitable for workplace browsing. Note: I have not yet integrated the cutthroats found by David-Antoine Williams’ oed.com script, listed in his Life of Words post. There is much work to be done. 2015 Cutthroat Internet World Tour! Does a Slingshot Sling Shots? Cutthroats are agentive and instrumental exocentric verb-noun [V+N] compounds that name people and objects by describing their function (i.e., a cutthroat is a person who cuts throats). They are composed of a transitive verb and its direct object. Cutthroats are freely productive in Romance languages, which have a V.O. (verb-object) structure and are left-headed. English, which is V.O. and right-headed, has slight native productivity (Clark et al, 1986) that has been amplified and augmented by French borrowings (e.g., coupe-gorge and wardecorps). English has been slowly producing new cutthroats since the 1200s up through 2015, mainly in the form of nonce personal insults. Most cutthroats are obsolete slang, but about 40, including pickpocket, pinchpenny, rotgut and spitfire, are commonly known in Modern English. 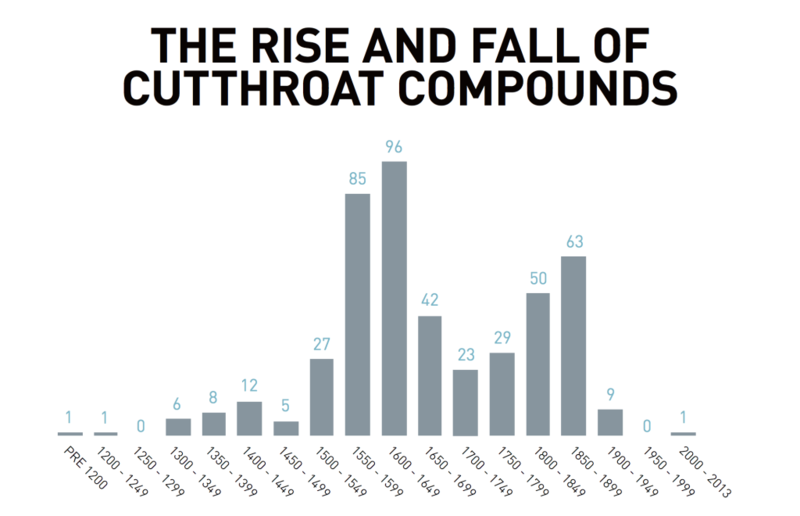 Gast (2008) compiled a database of “over 400” cutthroat compounds. Using his references, Hughes (2012) created a separate database with 483 cutthroats. In subsequent research, that list expanded to 815 compounds, 50 of which (slingshot, bundletail, rattle-head, etc.) currently lack the evidence to be definitively classified as cutthroats. Classifying the structure of a compound in any language is more complicated than it appears, especially when the evidence is only available in dictionaries, where there is little context. The two constituents in a compound can have any possible relationship, but lack the syntactic markers (which are available in larger phrases and sentences) to show it. There is no formula that determines how compound components relate to each other. Languages rely on features such as headedness, gender, case, and word class markers to guide their readers to the intended meaning. The English language does not feature gender, case, or a regular use of word class markers. This has resulted in high productivity of synthetic compounding patterns such as [N+V+er] and [V+ing+N], which use suffixes to compensate for the ambiguity unleashed by homonyms and zero derivation. Headedness, then, is the only reliable attribute in the pursuit of understanding English compounds. However, cutthroats are exocentric, and therefore headless. How, then, is it possible to find 815 compounds from a rare pattern, and positively identify them without the benefit of syntactic markers? The answer lies in taking advantage of the restricted tendencies of English cutthroats, namely the semantic clumping of certain verbs, nouns, and topics. Some topics such as criminals, misers, drunks, and children’s games appear again and again, while many others have never been observed. 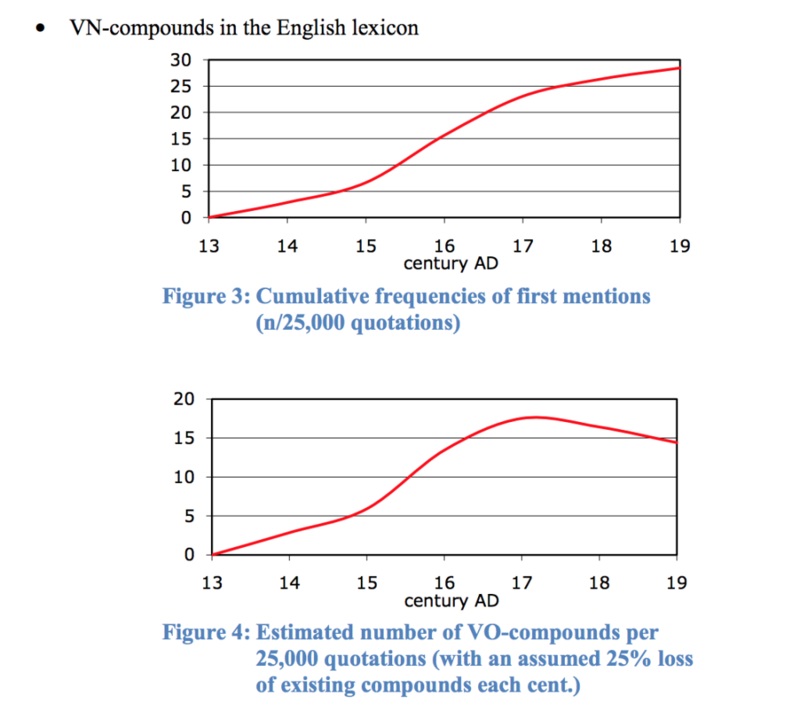 Verbs also clump (break, turn, make, lack, kill), with the top 11 verbs accounting for 150 compounds alone. Nouns recur as well, the most common being water, penny, devil, and nothing. With the OED Online as the starting point, the 260 known verbs in the pattern are searched in reference materials such as dictionaries of criminal cant and surname databases. Synonyms of those verbs are also searched, often resulting in new finds. In digital databases, where searches are not limited by alphabetical listing, new cutthroats may also be found using common nouns and topics. Progress is made by alternately pursuing leads from each of these three clusters. In one example, kill-priest (port wine) led to strangle-priest, strangle-goose, saddle-goose, and saddle-nag. The high productivity of [kill+N] and compounds related to the clergy led to a search of other [strangle+N] compounds, then [V+goose] compounds, and finally [saddle+N] compounds. Research continues in this manner, constantly expanding and strengthening the web of cutthroat verbs, nouns, and topics. With each new connection, more cutthroat candidates are rediscovered, and the membership of previously indeterminate cutthroats can be decided. The current list of questionable compounds will likely increase with further searches, then contract as new data integrates them into the pattern. 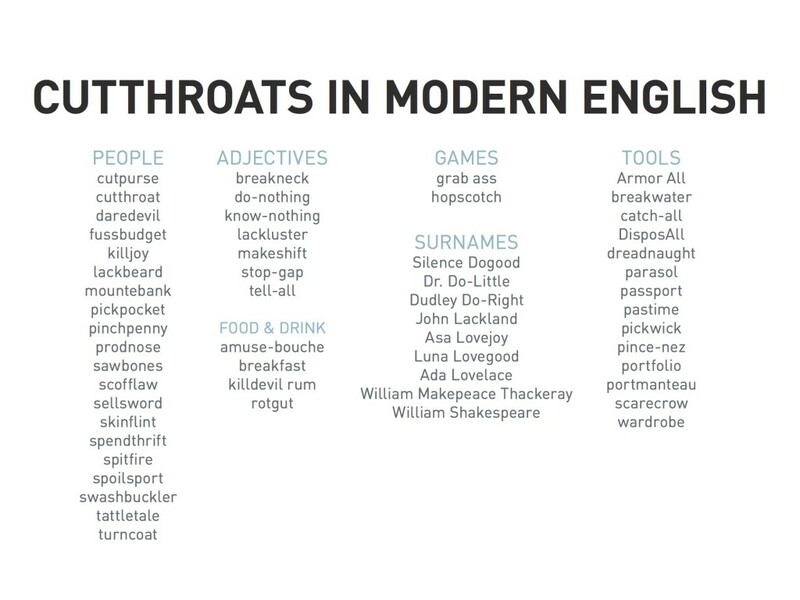 Further work can be done by seeking new cutthroats, analyzing the expanded database, and exploring Romance cutthroats, all in an effort to advance the understanding of this shadowy footnote of English morphology.